The following is a guest post by art educator Sharon Jeffus, the founder of Visual Manna. Art is very important for the preschool child. When I think of art for preschool and early elementary, I think of fun and adventure. I also remember that this age has a short attention span, and you don't want to bore them or they will turn you off. So lessons need to be varied with lots of action. Simplicity is the key to success in toddler and preschool art. As children get older, you can expect a longer attention span. It is also very important that preschool children learn to appreciate and verbalize about master art, which can enhance their reading skills. I love to hear parents say how amazed they were when they went to the art museum and their first grader could recognize master art. Practicing fine muscle control and strengthening eye-hand motor coordination is important in each art lesson. Learning how to control paint, crayons, scissors, and other art tools, helps children gain the skills necessary for later writing activities. Developing perceptual abilities is very important; help children to notice and verbalize about what they see. While looking at master artwork children can become aware of the elements and principles of art such as line, shape, texture, and color. They also can talk about what is happening in the picture. Making decisions and solving problems is a primary benefit of a good art lesson. Ask them what color should I use? How big should I make the person? Do I want to make a border? Becoming acquainted with the art of the past in master art, children become involved in learning something of their origins and themselves; it is a beginning history lesson. Experiencing success is a wonderful benefit of each art lesson. Because art leaves the end open to the creator, all children experience a measure of success. Just as in the idea that no three architects come up with the same idea for a certain building, originality and creativity allow children to succeed. There is no one right answer. This is why art activities are appropriate for children with special needs. Regardless of the physical or mental need of the child, there is some art media and activity through which he or she can experience success. Sincere encouragement by the teacher is important. Even if you only remark on how lovely it is the way they used the color green, that is wonderful! I always tell the story of how Edison failed over 1000 times before inventing the lightbulb. Failure in art leads to a new way to succeed. At a young age, you can teach all of the core subjects in art lessons. Math is taught as children learn basic shapes and lines. Even as you break a candy bar in two pieces, math can be taught. Breaking apart simple sculpture is also math. Telling time and counting money are both math. Science is observing God's wonderful creations. Looking at and doing simple animal pictures is science. Colors change when mixed. Textures feel and look different. Reading and language can be taught as children verbalize about their work and the master art at which they observe. Writing began as pictures so children learn letters as they do art. I always teach saying let's make a “Y” tree, or we can make a lighthouse that is an “11” that wobbles in. See sample S lesson. Nursery rhymes are considered children's literature. Combining stories and art is always a good idea. 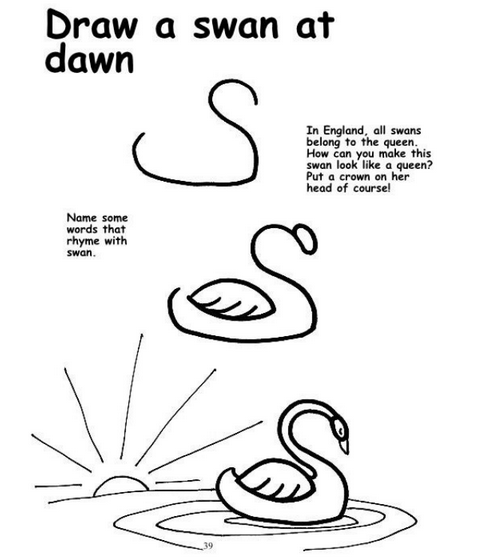 In the sample lesson about the swan, you could read a simple story of “The Ugly Duckling” as an introduction to the art lesson. Looking at master art with children needs to be a simple observation time with question and answer followed by a simple art project. 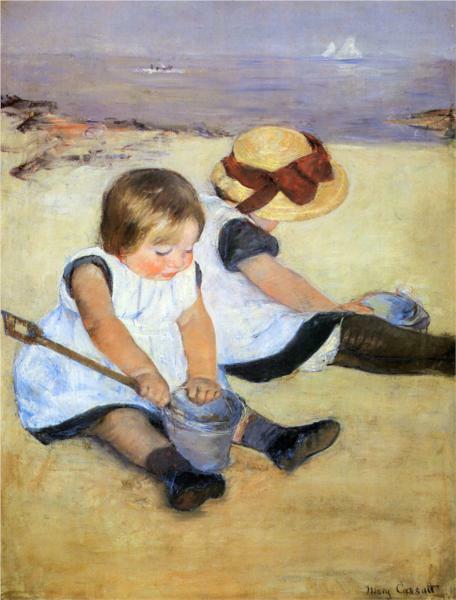 In the picture of the children on the beach by master artist Mary Cassatt, you can talk about the painting by asking the children what they see, how many children are in the picture, what they are doing, what color is the ribbon on the hat, and how many boats they see. You can also talk about foreground and background. 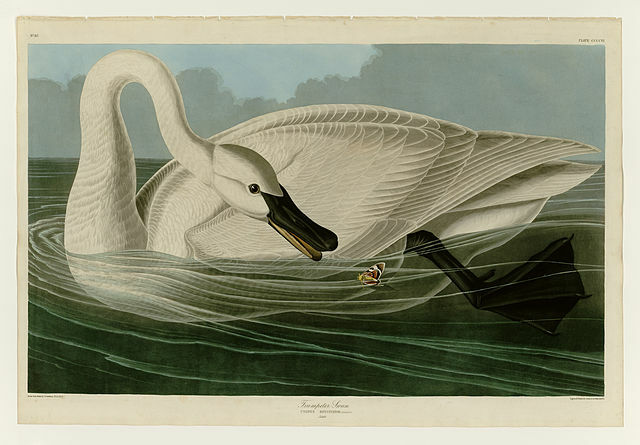 "406 Trumpeter Swan" by John James Audubon - University of Pittsburgh. You can explain that this is a swan. A swan is a bird that can fly. A swan can also swim. How many swans are in the picture? How many flowers do you see? What color are the flowers? Do you see the swan's legs? What color are they? How many can you see? Would you like to be in the water with the swan? You can get several colors of blue paper and tear the paper into long strips together. The child can paste them on for the water. This is a fine motor skill activity. Getting the child to verbalize during the lessons is always a good idea. You can work on word syntax and pronunciation in a fun and unassuming way. Show your children this picture by George Caleb Bingham. "George Caleb Bingham 001" by George Caleb Bingham - The Yorck Project: 10.000 Meisterwerke der Malerei. 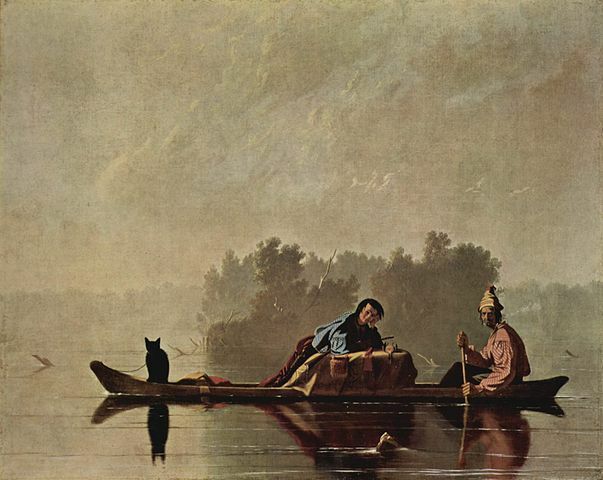 George Caleb Bingham was an artist who did pictures about life on the river. How many men do you see in the picture? Do you think the animal is a cat or a fox? Do you see something floating in the water? What do you think it is? What color shirt is the man in the center wearing? Do you think these men are going to try to catch a fish? Do you like the picture? Do you like the hat the man is wearing? There is a poem and song about rowing a boat. Read the poem below. If you know the tune you can sing it. It is a very well known nursery rhyme. In this lesson we will talk about vertical (a line standing straight and tall) and horizontal (a line that looks like it is sleeping) lines. We can also talk about basic shapes. Just as in our swan picture, lines that come out from the center are radial lines. Radial lines can come out from the sun and they can come out from the center of a wheel. 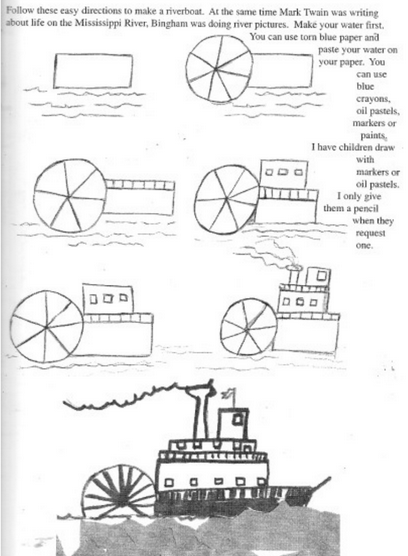 We are going to draw a riverboat. You can use torn blue paper for the water. I suggest using oil pastels or crayons for the drawing. In my opinion, cardstock paper is the best for younger children. A heavier pound paper will have less chance of tearing. I have saved a picture that my son did at the age of three of a bear. It only vaguely resembles a bear, but that is part of the treasure of the picture. I remember his pride in drawing it all by himself. Children become better artists with encouragement. I don't ever recommend coloring books with younger children because I feel as though it hampers creativity and originality. I will never forget walking into my doctor's office and seeing an exhibit of brightly colored art. I immediately thought “abstract.” I was delighted to find out it was the art of his three-year-old daughter. Art is very important to the education of the whole child. I now have my first book of these lessons for younger children in alphabetical order that incorporate the ideas in this article. Each lesson has a master artist that the children can look at, and a simple activity focused around a letter of the alphabet. You can email me at visualmanna@gmail.com for more information!!! I also hope to train young artists to teach little ones as part of my advanced art intensives I do at the Landry Academy. I also give two-day art intensives and you can go to the Landryacademy.com for information about dates and times. The Landry Academy offers a wide array of excellent educational materials. Sharon Jeffus graduated from John Brown University with a B.S.E. in Art Education and is the founder of Visual Manna. 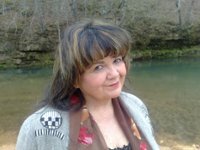 She has written over 22 books and has created the Visual Manna Teaching method which incorporates the elements and principles of art, art history and a variety of techniques in media along with each lesson. You can go to visualmanna.com or vmmclasses.com for more information. Her books and materials are carried by Rainbow Resources and she teaches across the country at the Landryacademy.com. You can email her at visualmanna@gmail.com.